KNSD-TV, the NBC owned and operated affiliate in San Diego will vacate its downtown studios by 2016. The station leases ground level studio space and the entire third floor of 225 Broadway and also has its logo on the top of the building, which is known as the NBC Building. Comcast, which owns NBC and the station, plans to move the station to a company owned building in the suburbs. KNSD-TV has been in the downtown building since 2001, when it also debuted a windowed studio for its newscasts. 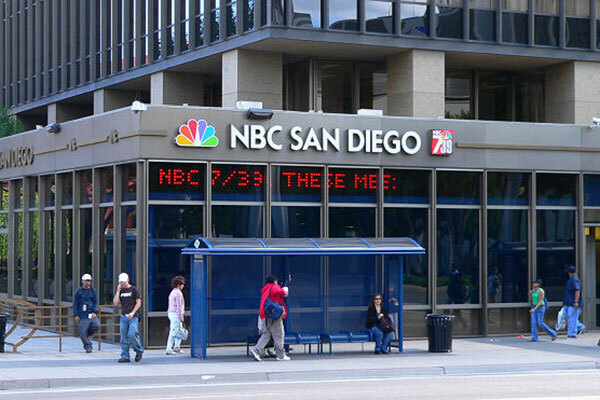 The studio space also featured prominent “NBC San Diego” branding and a ticker that wraps around the corner of the building.